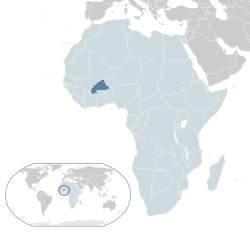 ↑ "Burkina Faso population projection". insd.bf (in French). 2014. Retrieved 1 October 2014. ↑ २.० २.१ "Burkina Faso". International Monetary Fund. Retrieved 1 October 2014. ↑ ३.० ३.१ "Burkina Faso". International Monetary Fund. Retrieved 1 October 2014. ↑ CFA Franc BCEAO. Codes: XOF / 952 ISO 4217 currency names and code elements. ISO.